Definition at line 22 of file SparcMCAsmInfo.h. Definition at line 25 of file SparcMCAsmInfo.cpp. 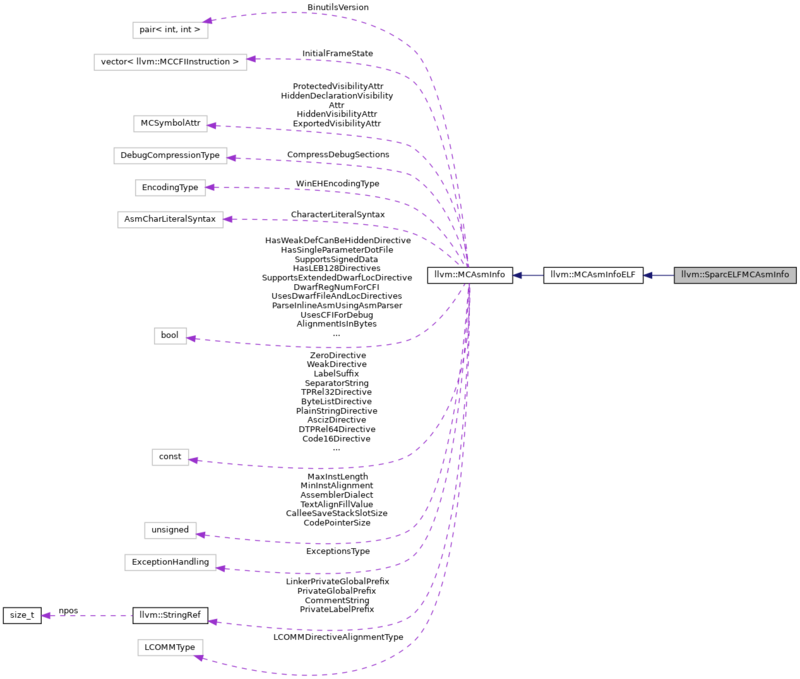 References llvm::MCAsmInfo::CalleeSaveStackSlotSize, llvm::MCAsmInfo::CodePointerSize, llvm::MCAsmInfo::CommentString, llvm::MCAsmInfo::Data16bitsDirective, llvm::MCAsmInfo::Data32bitsDirective, llvm::MCAsmInfo::Data64bitsDirective, llvm::DwarfCFI, llvm::MCAsmInfo::ExceptionsType, llvm::Triple::getArch(), llvm::MCAsmInfo::IsLittleEndian, llvm::Triple::sparcel, llvm::Triple::sparcv9, llvm::MCAsmInfo::SunStyleELFSectionSwitchSyntax, llvm::MCAsmInfo::SupportsDebugInformation, llvm::MCAsmInfo::UseIntegratedAssembler, llvm::MCAsmInfo::UsesELFSectionDirectiveForBSS, and llvm::MCAsmInfo::ZeroDirective. Definition at line 63 of file SparcMCAsmInfo.cpp. 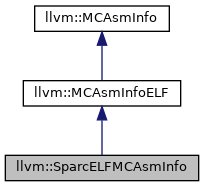 References llvm::SparcMCExpr::create(), llvm::MCSymbolRefExpr::create(), llvm::dwarf::DW_EH_PE_pcrel, llvm::MCStreamer::getContext(), llvm::MCAsmInfo::getExprForFDESymbol(), and llvm::SparcMCExpr::VK_Sparc_R_DISP32. Definition at line 50 of file SparcMCAsmInfo.cpp. References llvm::SparcMCExpr::create(), llvm::MCSymbolRefExpr::create(), llvm::dwarf::DW_EH_PE_pcrel, llvm::MCStreamer::getContext(), llvm::MCAsmInfo::getExprForPersonalitySymbol(), and llvm::SparcMCExpr::VK_Sparc_R_DISP32.